Controlled environment agriculture (CEA) can provide opportunities to produce strawberry fruit in a sustainable manner. Both aerial and root zone environments can be controlled in CEA and maintained in the optimum range to maximize the productivity of strawberry plants. Nutrient solution can be recycled to save water and reduce fertilizer use, making resource use even more efficient. Use of substrate/hydroponics eliminates the necessity of soil fumigation. Greenhouse structures exclude insect pests, reducing or eliminating the necessity of pesticide application. Strawberries are produced commercially in such sustainable ways in greenhouse in places like Japan and Europe. However the US has largely been left behind in this endeavor for strawberry, mainly due to the lack of practical information, appropriate education, and technology to support greenhouse hydroponic strawberry production. The goal of our project is to establish sustainable off-season hydroponic strawberry production in the desert southwest where there currently is very limited production of strawberry but there are strong greenhouse industries that successfully conduct year-round production of high quality tomato yet experience ever-increasing pressure for product diversification due to the aggressive price competition for the current products (i.e., tomato). This website will serve the current and future greenhouse growers to introduce strawberry as value-added crop in the desert southwestern US and beyond. The key information presented here is from our project at the University of Arizona as well as relevant literature. This project is funded by a grant from the Walmart Foundation and administered by the University of Arkansas System Division of Agriculture Center for Agricultural and Rural Sustainability. Any products, services or organizations that are mentioned, shown or indirectly implied in this website do not imply endorsement by the University of Arizona. 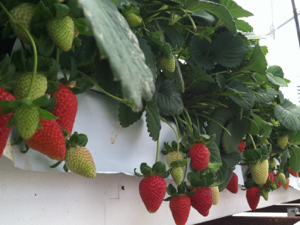 Welcome to the University of Arizona CEAC Hydroponic Strawberry Information Website! Our project goal is to support development of greenhouse strawberry industry in Arizona and beyond. The project is funded by Walmart Foundation.